JGE: Beyond the fact that Dolores is the main character of Ya nadie llora por mí, do you consider this book a direct sequel to El cielo llora por mí? SR: Yes, definitely. They are bound by similar themes. JGE: You have also talked about a possible third book with Dolores as the main character. SR: I think this character has the possibility of leading a series of books. Characters like him, in crime fiction, tend to come back again and again. JGE: Speaking of crime fiction, in other interviews, you’ve mentioned how the detectives of American or European crime fiction have the support of a functional system, unlike the system Dolores Morales is part of—the Nicaraguan. Is this a challenge or a joy for you as a writer, to write a detective who is knee-deep in a corrupt environment? SR: As a writer, I must work with what my reality offers, which defines the course of my narrative. If I didn’t live in Central America, if I weren’t affected by the Nicaraguan reality, I would’ve written another type of novel. My environment is contaminated. As a citizen, I desire a different reality. As a writer, I take advantage of it. I show it. JGE: From your words, I get the feeling that the novela negra could be a powerful tool for social critique that we ought to use more to expose the sinister side of a system like the Nicaraguan, Guatemalan, Latin American. JGE: Can we consider the novela negra close to the dictator novel like Miguel Ángel Asturias’s El señor presidente, perhaps because of its visceral content? SR: They are two different things, based on different backgrounds. What I did learn from Asturias, which I use for my writing, is that the dictator novel mustn’t be about the dictator, or about how he lives or hides. The dictator novel must be about his reach. I’m not interested in him as a character, but in how he affects society around him. I’m attracted by the political power that’s behind that corruption and the effects it has on society. JGE: It’s the same type of distance we talked about. SR: That’s precisely where art comes from. Writing does just that. When one considers everydayness, one must look for uniqueness too, for something that hasn’t been said. The search for singularity is essential for the writer. JGE: What does it mean, for you and your work, to have won the Cervantes? SR: It puts me on top of a platform, under different lights. I’m still the same writer, simply illuminated by other lights. This doesn’t make me a better writer. The recognition inspires me to keep on writing. The award is, simply put, a crosswind that lifts me and pushes me ahead. JGE: Part of your work as a writer has been to group and inspire Central American writers. What do you think that this award, the Cervantes Prize, even Claribel Alegría’s Reina Sofía Poetry Prize, means for Central American literature? SR: It puts Central America on the map as a region of culture and art. Ernesto Cardenal also won the Reina Sofía Poetry Prize years ago. This means we have authors worthy of Hispanic-American attention, literature that people must look at, and it confirms that we have a cultural identity. And, of course, we must never forget Miguel Angel Asturias’s Nobel Prize, awarded fifty years ago. JGE: Can we also talk about inspiration or ambition for the region? SR: Definitely. I’m interested in inspiring the new generations of writers, making them aware that there’s no such thing as regional writing. It isn’t relevant that I’m Central American, or Venezuelan, Polish; writing is writing. There’s no such thing as men’s literature and women’s literature. There’s literature of high quality that’s what we must aspire to do. We must also leave the provincial space; we mustn’t be allowed to be jailed by our own countries. The world is out there. Prizes awarded to Central American writers, and Central American prizes awarded to the young, can bring attention to our writers and make publishing houses see them. SR: Yes, Horacio Castellanos Moya. JGE: Gioconda Belli, you. Even young writers like Carlos Fonseca. JGE: How can we replicate this? How can we nurture our young writers? We must look for them first; find them. That’s why literary prizes are so important. They help us discover new talents. Stages like Centro América Cuenta give our writers the opportunity to meet with authors from Venezuela, Mexico; meet magazine editors. These events help bring awareness to our literature. JGE: How can these writers take advantage of the regional book fairs and Centro América Cuenta? JGE: Last year won by Andrea Morales, from Guatemala. SR: Exactly. Well her story is going to be part of an anthology published in Marseille. These are the kind of tools we have available to our writers. We’re also forcing the international publishing houses to look at us. We’ve received comments from Random House and El País. Nobody can guarantee success, but we can open doors and create opportunities. JGE: What do you think Central American literature needs to compete with Mexican or South American literature? SR: We have obvious limitations: our market is smaller, for example. We don’t have any big publishing houses. We need the attention of Mexico and literary scouts. We have a weak market and few readers. So we must create those readers. Centro América Cuenta has been working with Managua’s biggest bookstores to start book clubs. That’s what we need, to develop readers. JGE: The work done by Central American publishing houses, most of the time, merely focuses on checking for typos or fixing grammatical errors. Books go from the writer to the bookstore mostly unedited. And most of the time there aren’t any publicity efforts. Some see this as something positive. The writer can publish his or her work more easily while the publishing house doesn’t expect unrealistic sales from the writer. Others see this as something negative because it perpetuates a stale market. How do you see it? SR: I see it as us facing our difficulties. We know about our obstacles and these publishing houses have managed to get past them. This doesn’t just happen in Central America, you know. Look at Paraguay, Bolivia, Ecuador; they have the same limitations. I think that at this point it’s not just about putting books out there; it’s about what we do with those books and who are reading them. We mustn’t merely publish books and leave them at the bookstore. We have faced the limitations of not having publishing houses in Central America. We have them now. But now we have to move those books. We must return to the international book fairs, publicize our books, talk to literary agents, etc. JGE: We have talked about reaching the Latin American market. But we have also talked about reaching past our language. There are only a handful of Central American writers that have been translated into other languages. Even if we talk about the Premio Alfaguara—which you won in 1998 with Margarita, está linda la mar (Margarita, How Beautiful the Sea)—not all of the winning books have been translated into English, for example. Can we critique the lack of attention other markets demonstrate towards Central America? SR: I think not all books have the same luck. We don’t have to see this as a defeat. Some books get more attention than others. Some books are more appealing to other markets than others. Some award-winning books are simply not appealing to foreign readers. Even those that make it into other languages might fail. Some local failures might find success in other languages too. It happens by chance, I think. 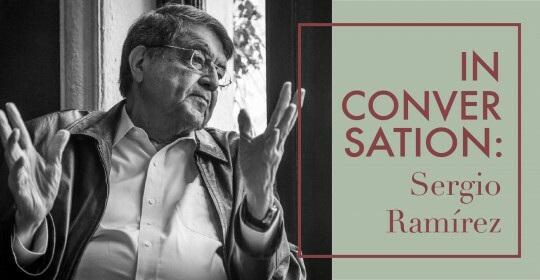 On April 23, Sergio Ramírez will receive the Premio Cervantes at the University of Alcalá in Madrid, Spain. Sergio Ramírez is the winner of the 2017 Miguel de Cervantes Prize and 1998 Alfaguara Novel Prize for his book Margarita, está linda la mar. He was born in Masatepe, Nicaragua in 1942. He is part of the generation of Latin American writers that came out after the Boom. After an extended period of voluntary exile in Costa Rica and Germany, he abandoned for some time his literary career to join the Sandinista revolution that toppled the last Somoza. He resumed writing in the eighties and in 1988 he published Castigo Divino, with which he won the Dashiell Hammett Prize in Spain. In 1998, he won the Prix Laure Bataillon with his next novel, Un baile de mascaras. Alfaguara has published a collection of his short stories in 1998, with a prologue written by Mario Benedetti; Mentiras verdaderas (2001); los volúmenes de cuentos Catalina y Catalina (2001), El reino animal (2007) and Flores oscuras (2013); as well as novels like Sombras nada más (2002), Mil y una muertes (2005), El cielo llora por mí (2008), La fugitive (2001), and Sara (2015). Alfaguara has also published Sergio’s revolutionary memoir, Adiós muchachos (1999). Margarita, está linda la mar also won the José María Arguedas Latin American Prize, given by Cuba’s Casa de las Américas. He received the José Donoso Ibero-American Literary Prize in 2011 and the Carlos Fuentes Prize in 2014, both for his life’s work. José García Escobar is a journalist, fiction writer, translator, and former Fulbright scholar from Guatemala. He received his MFA in Creative Writing from The New School in New York City. His writing has appeared in The Evergreen Review, Guernica, and Words Without Borders. He is Asymptote’s Editor-at-Large for the Central American region.